Studying the Bible book of Ruth, here are some of the lessons I picked. Ruth understood the meaning of love. She stayed with Naomi in her difficult moment. She could have decided to go with something better, but she went through hardship with her. Are you that woman who would dump your man and friends when hardship sets in? Are you Orpah or Ruth? In Chapter three, I discovered some interesting things about love. 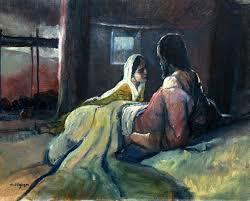 Boaz got up at midnight and saw Ruth lying beside him as instructed by her mother-in-law, Naomi. Naomi's late husband was a relative of Boaz and she wanted Ruth married to Boaz. When Ruth told Boaz who she was, Boaz did not take advantage of her. He first of all praised her for not abandoning her mother-in-law to go after young and rich men. He praised her for being a virtuous woman. Boaz understood a woman's need for appreciation and compliments. In the morning, Boaz made sure Ruth's name was protected. He made sure no one saw her leaving that early. Isn't this the kind of love every woman should pray for? To be protected by that person who claims to love her is the heart-cry of every woman. A man that will protect her even when they are no longer together. How many of such men do we still have today? They'd rather come up with lies against you to be sure no other man comes your way. If you are one of such men, you are not a man. Don't forget; Boaz knew that, according to custom, he was not the the right person for Ruth, but he did not take advantage of her. He did not decide to sleep with her first as he wasn't the right one to have her as a wife. He covered her until morning. While sending her away in the morning, Boaz gave her food. He provided for Ruth even when he did not sleep with her. Real men give to women without wanting to see their nakedness. If the only time you give to her is when you see her nakedness, you don't know what love is. If the only time you fight for her is while she's yours, you are far from knowing what love is. Ruth always listened to the words of Naomi. How many of us still give heed to their Wise Counsel without tagging them 'old skool'? Are you one of those who have dropped he ways of our people to go after those strange ways? Are you one of those girls who now believe they have to move in and live with a man who has no regard for the girl's parents and who feels there's no reason to go see them and ask for their daughter's hand in marriage? "Remove not the ancient landmarks"; so says the Holy Scriptures. Ruth would always give to Naomi. She loved her mother-in-law. Do you love yours? Ruth lived and walked in favour. The most important thing in your life is favour. Instead of wasting time hunting for men, please spend more time finding favour before God and you will see men running and fighting themselves to have you. Finally, Boaz made public his intentions towards Ruth. He didn't keep it hidden for long, he gathered the elders the next morning and when the right relative failed to redeem her, Boaz did. Ruth became his wife. Ladies, a man who truly loves you won't waste much time before taking you to mama. The excitement in his heart won't even let him keep you a secret for so long. If he has kept you waiting for years with no good and acceptable reason, he's possibly looking for something better and if he finds that better thing, there would be a replacement. This Moabite, Ruth, gave birth to David's grandfather, Obed. Jesus Christ our Saviour came from this genealogy. If God could use this woman from Moab, never let anyone tell you how unqualified you are to be used by God. He used Rahab; He used Ruth; He will use you.